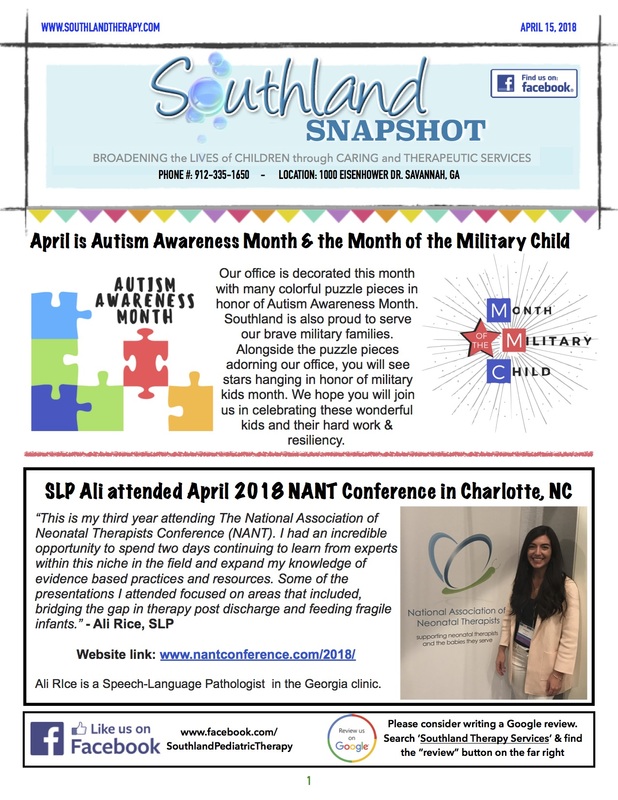 Southland Snapshot: April Awareness & OT Month! - Southland Therapy Services, Inc.
Our office is decorated this month with many colorful puzzle pieces in honor of Autism Awareness Month. Southland is also proud to serve our brave military families. Alongside the puzzle pieces adorning our office, you will see stars hanging in honor of military kids month. We hope you will join us in celebrating these wonderful kids and their hard work & resiliency. Ali RIce is a Speech-Language Pathologist in the Georgia clinic. Savannah morning, Owner Dee Dee, Outreach Coordinator Laura (with daughter Abigail), and PT Katie were all smiles on March 31, 2018 as the event began. Physical Therapist Katie ran the 10k race while Dee Dee and Laura manned the table and handed out Southland cups, brochures and goodies. “We love supporting the students at GSU,” Laura stated, “the PT and SLP students are the future of the therapy field and I think it’s awesome for them to see our organization out at these events and showing up.” A few days later Southland attended the GSU career fair which was a great success! In the week leading up to Easter, our patients worked hard to make adorable bunny themed crafts. After a week of being creative with our therapists, they were ready to hippity-hop into the Easter weekend. chalk, bubbles, sand toys and more! (with a few surprises!) Stay tuned for more information! We want to wish our Southland Occupational Therapists a happy OT month. Thank you for all your hard work. Georgia OTs: Megan & Nicole and South Carolina OTs: Bernadette, Camille, Charly, Bridget & Melinda- We are lucky to have you on our team!